Veteran hit-maker J Martins kicks off his exploits in 2014 with a melodious treat for fans and music lovers all over the continent. Showing the importance of sticking with a winning formula, J Martins reunites with past conspirators DJ Arafat with his energetic chants and additional vocals by Fally Ipupa – to deliver yet another incredibly rhythmic and movement-inducing club banger titled Faro. 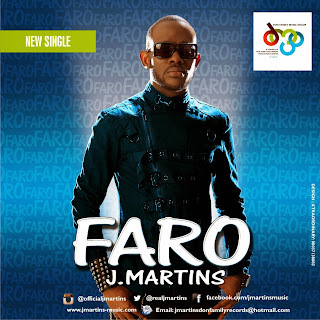 DJ Arafat, who was a major part of the success of J Martins last effort – the monstrously successful ‘Touching Body’ – picks up where he left off and keeps the energy levels in the song surging all through. Together with Fally Ipupa – with whom he created the club hit Jukpa – the trio unites the continent with yet another anthem that is oblivious to geographical boundaries and cultures. “No matter how successful you become, it’s always important to remember the source of your blessings. Looking at my life and the lives of my friends, there is a lot to be grateful to God for. And that is what Faro is about. I would like to thank God for saving my brother Fally Ipupa who survived a major motor accident last December. Thanks to my great friend and brother DJ Arafat, my humble appreciation goes to my die-hard fans and the media for their continued priceless support” says J Martins.